Provides basic information on your ancestors back. 4 generations on 2 surnames where possible. Copies of census records and other records. An electronic version as a GEDCOM file. Additional charges apply for postage, and any certificates obtained e.g: Birth Certificates, Baptismal Records, Marriage Certificates, Death Certificates, (£12.00 each). On average the time spent on this package is 20 hours. 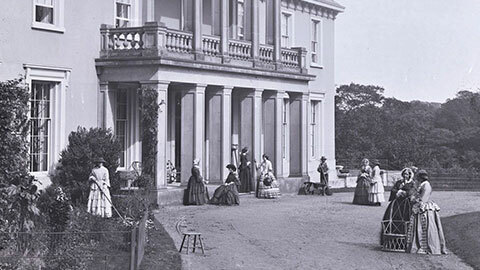 aim to trace your family back to the late 18th century / early 19th century. you could also choose this option if you would like us to investigate 2 or 3 branches of your family at once. 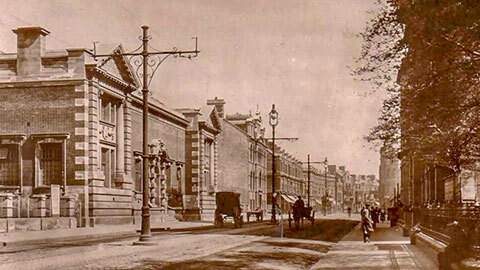 Additional charges apply for postage and any certificates obtained e.g. 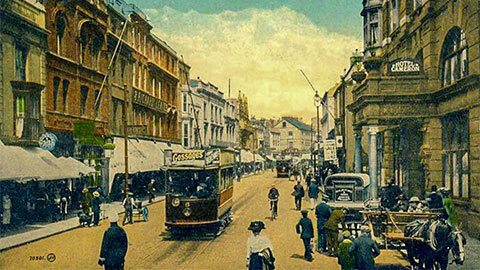 : Birth Certificates, Baptismal Records, Marriage Certificates, Death Certificates, (£12.00 each.) & postage. On average the time spent on this package is 50 hours. Our most popular package, If you are looking for the ultimate in research. We will research as far back as possible on the four main surnames. reports and copies of all documents found during research. An electronic version as a GEDCOM file via email. If the packages above do not suit your budget then our Pay As You Go package allows you to manage the research and the cost. We can research your family tree as a whole or part. You would pay us a set amount that would be agreed beforehand and we then continue our research until that ‘pool' of money is exhausted. At that point you would then decide whether you wished to continue or not. If you decide to continue with our research, you would simply top-up your account. Hourly research rates are charged within this package. 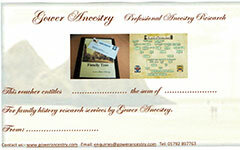 Duplicate copies of Family Tree Files can be purchased for £55.00 each. A great present for a member of your family. Professional quality charts from Maxbal Genealogy. 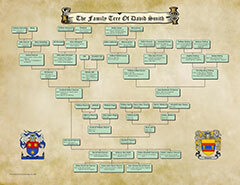 Digitally printed family tree posters start at £45.00 (4 generations). 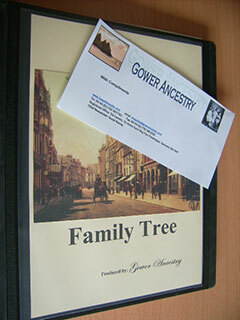 Gower Ancestry gift vouchers – A fabulous present for family or friends. Please ask for more details.